This is an easy weekend task that took 1 hour and 20 minutes and cost £30 ($39). 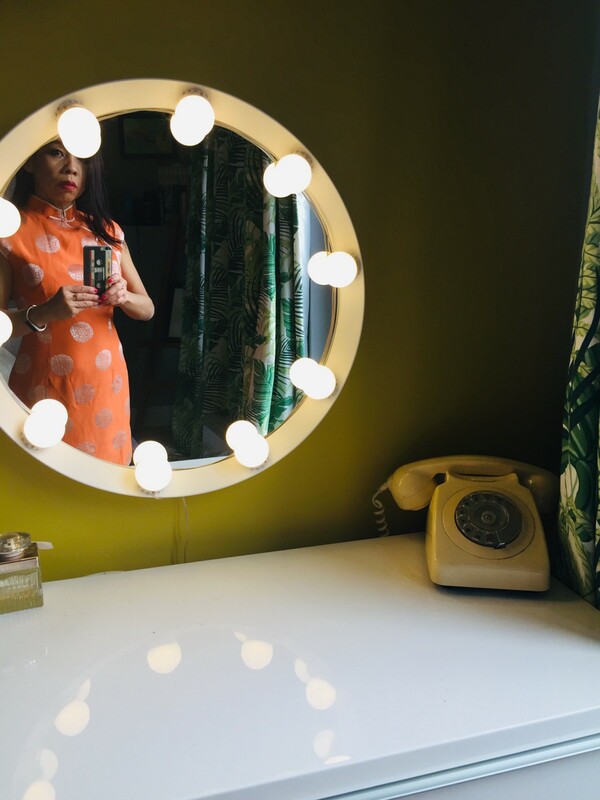 I have always wanted a Hollywood style lighting up vanity mirror but they are very expensive. One of the main aims of doing DIY is to save money and secondly to customize something to your exact requirements. First I had to actually spend money (yeah, I know). After scouring thrift stores, I could not find any mirror of the right size. I then had to make the trip to IKEA and I bought this £20 ($26) round mirror. Use alcohol to clean the entire mirror frame and mark 10 equidistant sections. Then I had to spend more money, buying a kit of 10 bulbs, instructions, dimmer and wiring. There are so many suppliers doing this on Amazon and eBay. The cost is about £9 ($11) including delivery. This is all you will have to spend. Carefully dismantle the base of the lights to get at the wiring. Pull it out without the whole length coming out. Adjust the wiring such that it’s equal lengths, roughly and tuck back any spare. The in and the out of the wiring should be from the same hole so as to be able to conceal it within mirror frame in the next step. This bit is very fiddly. I had to do it 3 times to prevent entanglement. Stick the lights onto the mirror frame using strong double sided tape and use a flat bladed screwdriver to gently shove the wiring back into the mirror frame. Test the dimmer. Lastly, hide the dimmer and again double-side tape it either to the back of the mirror frame or the vanity top/dressing table top. I did the latter. You will not see the dimmer unless you put your finger behind the top to get at it. Previous articleDIY : Faire un canapé avec des palettes, c’est pas que pour les pros ! DIY Skin Care Tips : How to curl your lashes.